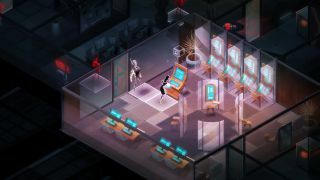 Klei Entertainment, the developer of Mark of the Ninja and Don't Starve, has announced that the turn-based tactical espionage game Invisible, Inc., will leave Early Access and go into full release on May 12. A "deliberately vague" list on Steam breaks down what the team has been working on since the previous update in January. Highlights include a fully-realized story and game world, more than 1000 lines of new voiceover, three new starting programs, four new agents, a demonic new enemy, and The Final Mission—dun dun dun! The downside to finally knowing the launch date is that, as promised, Early Access sales have been halted, although anyone who already owns it can continue to play. "We want everyone to experience the game in its fully realized version when it launches," the studio said. I really dig the visual style of the new screens and launch trailer, and our Early Access review from last year was quite positive too, saying, "Invisible, Inc. borrows from X-COM wisely while adding enough of its own flavor to make it more than just a copycat. It's not as big or as accessible of a game, but the stealth and turn-based strategy mashup is new, and highlights what's most fun about both genres." Find out more at invisibleincgame.com.